Remains of a large, red inscription, see EA1984.64; there also is a border band which is identical to EA1984.70 and EA1984.71, with alternating red and blue lozenges. 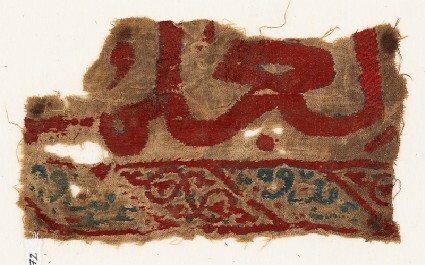 The inscription and band design are embroidered in couching stitch; laid threads are couched down over surface satin filling stitches. Outlines are worked in stem stitch.